Silk velvet is a luxuriously plush fabric made from a blend of silk and viscose. It has a loose and full flowing drape that is sensual and suited for formal wear. Our viscose is made in Austria, from sustainable forests and award-winning non-polluting techniques. The use of these yarns costs more, but we feel it is worth it! We design and manufacture our own exclusive Elizabetta specialty luxury items in addition to bringing you some of Italy's other fashion designer labels. This fabulous silk velvet shawl will turn heads as it keeps you warm on a special occasion. 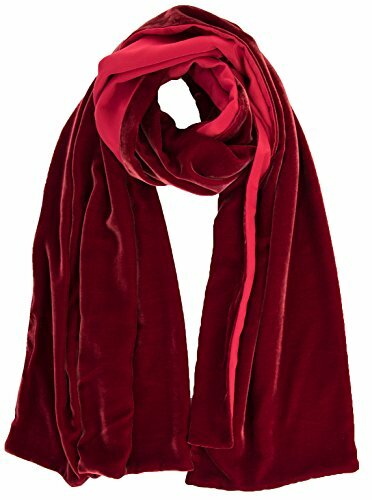 Add timeless glamor to your look with this luxuriously soft and plush ruby red silk velvet wrap that we've fully lined with red silk crepe for added luxury and a slip resistant hand. Add the perfect finishing touch for that special occasion. Silk velvet is timeless and longlasting.